I am currently in Australia and my family is in India currently. I am raising this thread to check for some queries related to vegetarian food. Nearly 6 years back, when I struck spirituality after reading Shreemad Bhagawad Geeta, then after that I stopped eating non-vegetarian food including meat and eggs. I eat vegetarian food including dairy products like milk, curd etc. This was going comfortably in India, as I had my family with me and since my wife is also vegetarian, so she cooked vegetarian food for me. Now for the last 4 months, I am in Australia and here vegetarian food includes eggs. The reason for me to stop eating non-vegetarian food was to not hurt other sentient beings. A query which I have is: Does eating eggs (after buying eggs from supermarket) and eating things (which include egg as an ingredient) involves hurting to hens? Here in Australia, I got a chance to visit a monastery – there I came to know about the eating schedule of monks, which was breakfast around 7am, lunch around 11am and then in evening around 6pm have tea with dark chocolates. When I came back to my rented room, I thought to try just having dark chocolate and tea/coffee in evening and I tried it and no problem with me, even though I am doing this for the last 3 weeks nearly. So my eating schedule is breakfast in office with cornflakes/cereals with milk and tea, then lunch at office which includes just some breads (as I do not cook and I am too lazy to go out of office in afternoon to a restaurant to have a lunch) and then after coming to my room in evening I have tea with dark chocolate. I was already a thin person in India, so what I am observing is that these days, I have become slightly more thinny and more skinny. I work as a software engineer, so no much manual work – I do not exercise and the physical activities involve going from room to train station to get the train to office in morning and then the return back to room in evening. Thanks to God that currently I do not have any health related problem. But these days, most of the time, my mind is going to food, and worries like – Am I depriving myself of food? Am I eating too less? are cropping in my mind – even though I am not feeling any health related problem currently. So thought of asking suggestions from you all. Do you think I am eating too less? If not eggs and I do not cook, what other food options are there, which I can buy from supermarket and just have it in my lunch? So please suggest. Thanks. Generally most animal products sold in stores are gathered from factory farmed animals and the conditions they are raised and live in are really unpleasant and do cause the animals suffering. Even so called free range chickens are allowed to leave their cage but rarely do. "Backyard eggs" raised by individuals are probably the most ethical but there are certain issues in the system overall. Like when getting the chickens they generally come from large scale producers where males are killed. Or the genetic and breeding manipulation of egg laying hens reduces their longevity and quality of life. But in the end I think eggs are about as humane as dairy so if you're alright with dairy then you should be alright with eggs too. Thanks @person . But the eggs, which I will get will be from supermarkets and the food products which have eggs as an ingredient (I don't know from where those eggs would be coming from, but since it is a factory which is making that finished food product and then packing and selling it - so I think I can assume that those eggs used would be also from some supermarket or some shop, rather than from any individual who is having hens in his house and selling its eggs) - So then, if we consider this scenario of eggs from supermarkets, can we be sure that these eggs from supermarkets involve some hurting to hens? Any thoughts here please. Thanks. Unfortunately we can't be sure that the hens that lay the eggs we buy in the supermarket aren't being hurt. The same as I can't be sure the guy in the 7/11 I bought the can of coke from this morning is being paid minimum wage. Or the person who sewed the shirt I wore to work today is working in reasonable and safe conditions. When it comes to eggs at the supermarket, I look at the packaging and choose those that appear to have the best conditions for the hens. In Australia the info you get given is pretty good. Some even have "hen-cam" where you can go on and watch live coverage of the hens in their environment. I think it's a good intention that you want to reduce the harm you contribute to in the world. You're never going to eliminate that harm entirely so the question you need to ask yourself isn't how can you entirely eliminate harm to others, but instead I think it's about keeping that intention in mind while also balancing the need you have as an individual to maintain a healthy, happy life. If you're weak and miserable you'll be less effective at directly helping others. Thanks. I think it comes down to this portion of your above post - balancing the need you have as an individual to maintain a healthy, happy life. If you're weak and miserable of your above post. Am I really depriving myself and leading myself to not being healthy? I don't think so. Just that my mind keeps on thinking about food and creating dramas in my mind saying that - 'look, I am only having a bowl of cornflakes with milk and tea in morning, in lunch 3 slices of bread and may be 1 fruit occasionally and then in evening 3 pieces of a dark chocolate with some nuts like almonds and coffee - this seems to be having taking less food on a daily basis - see that is why I am looking more skinny, more bony - my collar bone seems to be emerging more etc.' - But who knows this may be my mind just creating stories for me to worry about. Afterall, I am going to office daily and even though I have been continuing this food routine for the last 3 weeks nearly, I do not feel weak in health in office - there sometimes is a slight headache, but it can be due to the fact that since I have low blood pressure, so because of less salt intake that headache is occurring, so when I feel this headache, I take some salt in tea or coffee to have some extra salt in my body through drinking that tea or coffee. Yeah and you can go vegan in Australia. We're not entirely archaic in food practises. What does Zen or Mahayana Buddhism say about - which type of food should we eat? Is eating non-vegetarian food allowed in Zen or Mahayana Buddhism? Any information here please. Thanks. Am I depriving myself of food? Am I eating too less? You sound mal-nourished. The clue is always thinking about food. Try eating some. Surely Australia must have farmer's markets and CSA (consumer supported agriculture) and similar things. If you follow the line down the rabbit hole far enough, everything we drink and eat causes harm somewhere. But locally farmed eggs are typically much better than most supermarket options. I get them cheaper from neighbors than I can get them at the store, but a lot actually. And they are true free range chickens who eat what chickens are meant to eat. Yeah, we do @karasti. Farmers Markets everywhere. A kind of a stupid question, but since I do not know, so still asking: How does one differentiate a normal egg (which does not have a chicken inside it) with an egg, which is to hatch into a chicken? How are these 2 types of eggs differentiated? Any possibility of a human error in mistaking an egg (which could have hatched into a chicken) for a normal egg? Any information here please. Thanks. All zen traditions, outside Japan, are strictly vegetarian. @misecmisc1 Most people who keep chickens ensure that they cannot be fertilized unless they intend to hatch chicks. That's actually especially true with supermarket eggs, because the hens are confined and do not have access at all to roosters. Often you will find locals who keep chickens also keep a rooster, which is usually there to help protect the hens and can get quite violent against predators. Not always, I do know people who keep only hens. But most people I know who keep chickens do not allow them to mate unless they are looking to hatch more chicks. People who run egg farms do not have these concerns and have no need to have a useless rooster when their focus is the eggs. They just keep thousands of hens in small cages, so there is no risk of them being fertilized. In any case, even if the egg were fertilized you would have no idea. The only way to entirely prevent fertilization is to keep roosters and hens separate. But it's not like you collect eggs after such a length of time that you'll crack open an egg and a partially formed baby chick will fall out. Eggs are usually collected daily, and for them to grow into chicks they require the hen to incubate them for 3 weeks. 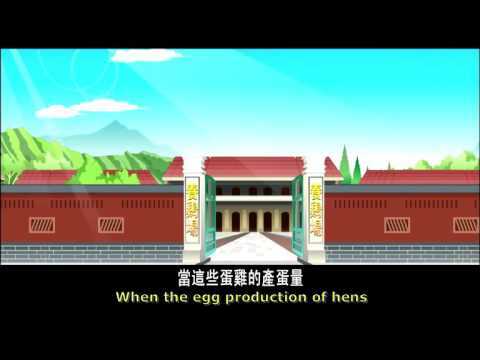 This cartoon is about why we should not eat eggs was made my Master Haitao's Life TV. But make sure they're free-range from a reputable supplier. Source the product, don't buy blindly. Which came first...The chicken ? Or the egg? What does free-range eggs means? Please suggest. Thanks. Eggs from chickens not kept in cages. "Slapping ‘free range’ on a box of eggs simply hides the catalogue of routine horrors that are allowed under this reassuring banner"
M&S Free-Range eggs are actually free range from regularly-visited and frequently-tested farms. When it comes to "Free Range" a company in NZ does "this"
Woodland eggs that @Shoshin mentions available in UK and US too. The eggs are marked and can be traced to farm origin. Diverse woodland tree planting encouraged for chickens to forage in and avoid foxes. At night they have indoor sheds and extra food options. @Shoshin: just watched your youtube video URL in above post. We call this food-item as besan ka chilla. Its tasty. Well, the problem remains the same almost then - even for free range, it needs to be checked if they are from hens, which are not kept in cages. Also, eating eggs which are free range eggs, makes the problem even more complicated as then we will have to tell others that we eat eggs, but only free range eggs. For food items like cakes etc, which has eggs in it as an ingredient, there is no method to check whether the eggs used as an ingredient in the making of that food product by that food company were free range eggs or not - I think if we are talking about food products from food companies, then since they are manufactured at a factory level and then packed and shipped to shopping stores, most probably the eggs used will be the same which are normally available in supermarkets. In supermarkets, the eggs which are not marked as free-range means that those eggs are from hens which are kept in cages - is this understanding correct? Is making this assumption correct that most supermarkets would have in majority eggs from caged hens and a very little amount of free-range eggs? What is the cost difference between a caged hen egg i.e. a normal egg and a free-range egg - may be this would be one of the factors which would be taken into consideration by the supermarkets in deciding which type of eggs to keep? It’s worth looking into the differences between free range and organic or biologique eggs. The latter designations are a lot more strict, at least in Europe where they are protected and you can’t just label your food with those labels without being able to back it up. Dude, if you're in Australia then look for RSPCA eggs which are free range and definitely "legit". Otherwise, ASK when you're at the supermarket. Alternatively, go to a local market or grocer and purchase from there. I don't get why you're stressing out about it on here when there are plenty of people you can ask IRL. We're quite modern here in Australia. Well, the problem remains the same almost then - even for free range, it needs to be checked if they are from hens, which are not kept in cages. The problem really is that even when hens are not kept in cages they are still subjected to practices that cause them suffering. Generally yes. However, "not kept in cages" does not equal "animals are treated humanly". As for Australia RSPCA, this is a good overview of what the various labels mean. "Making sense of egg labels"
Also, eating eggs which are free range eggs, makes the problem even more complicated as then we will have to tell others that we eat eggs, but only free range eggs. To me the point of ethical eating is the reduction of harm to the animals rather than being pure individually, so it isn't necessary to be %100 pure here. When buying eggs to use at home you can insist on eggs raised as ethically as possible or choose another option if out to eat. But if you're at a friend's house or a party with cake or something it'll be a lot easier all around if you just eat the cake "tainted" by conventional eggs. Since you're a Hindu and maybe have other considerations, like karmic or something similar, purity might be important for you though. The link I shared was the one I meant. If you go to the link you shared and click on "Click here for the full details" under the chart. That is the link I shared. Both websites are from the same organization "Animals Australia"